In Mexico City, Ricardo Ferretti’s list of 23 players that he would take to Argentina for El Tri‘s November friendlies was released today. Among the list of 23 players ‘El Tuca’ called in were eight Europeos, including a return to the national side for Guillermo Ochoa and Miguel Layun, who makes his first appearance for El Tri since the 2018 FIFA World Cup. 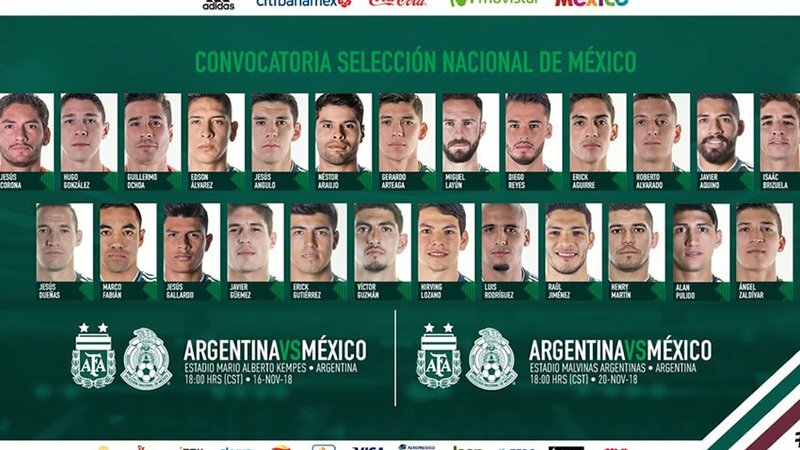 Hirving Lozano, Erick Gutierrez, Diego Reyes, Marco Fabian, Nestor Araujo, and Raul Jimenez are among the other Europeos who are expected to join up with the rest of the El Tri side starting on Sunday, November 11 before training and heading in the direction of Argentina to play the Albiceleste in Cordoba (in the north central part of the country) on November 16 and in Mendoza, which is situated less than 250 miles from Argentina’s western border with Chile in the Andes, on November 20. There were also several surprises in Ferretti’s national team selection, most notably the recall of Alan Pulido into the national team instead of Toluca striker Alexis Vega, whom many observers had hoped to see. Marco Fabian, despite his near-exile from any activity with Eintracht Frankfurt,is also included in the side over several players who feature more frequently for their sides. Here is the full squad that will travel to Argentina for the November friendly dates.